Finding roof damage either during a pre-purchase inspection or after a major storm can cause significantly levels of stress and financial uncertainty. While roofs in Phoenix are engineered through design and the materials used in construction, exposure to triple-digit temperatures, heavy monsoon rain, and potentially devastating haboobs can take its toll. When you need to have a roof replacement completed, relying on a professional roofing company in Phoenix with the professionalism, experience, and proven results of completing roofing projects within budget and a focus on quality – not quantity ensures the job is completed correctly. This is why Phoenix home owners and property managers depend on AZ Roofing Works for all of their roof replacement needs. Since 2013, AZ Roofing Works has served Phoenix home owners, property managers, real estate agents, and more with high-quality roof replacement services. Our team of licensed, insured, and bonded roofing experts focus on quality with every interaction, always act in a professional manner, and complete detailed clean up when we are finished. Tile roofing is arguably the most durable of all roofing materials, in some cases lasting more than 50 years. However, whether due to excessive wear and tear, or damage caused by accidents – eventually they will require replacement. 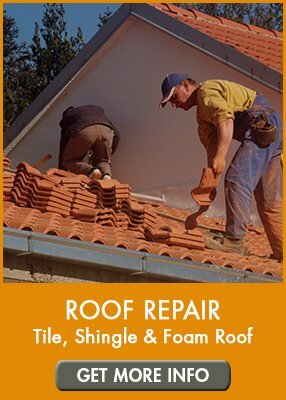 When it’s time for you to replace the tile roof, AZ Roofing Works has the resources and experience to complete your tile roof replacement in Gilbert quickly and efficiently. AZ Roofing Works has the bandwidth to secure several material types of tiles that can be used during roof construction including clay, concrete, composite, metal, or Spanish style. We can even mix and match materials to suit your individual taste or HOA compliance. Shingle roofing is commonly found on older homes. The shingles are made from a few different materials including asphalt or polymer shingles are installed in a similar overlapping pattern as tiles. They are much less expensive than tiles, but the drawback is that shingles are much lighter and have a life expectancy about half that of tile. Their lightweight design also makes them prone to damage due to fallen tree branches, blowing wind, lightning strikes and more. 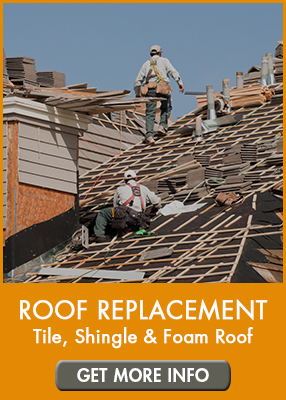 If your shingle roof in Phoenix is damaged, AZ Roofing Works offers a professional and affordable replacement solution. Another popular style of roof in Phoenix is the flat or foam roof. A flat roof is designed much differently than a tile or shingle roof. There are also several unique material types used in a flat roof such as modified bitumen, BUR (build-up roof), foam, and PVC – each of which requires specific installation and replacement procedures. Like the shingle roof, a flat roof is prone to earlier wear and tear and will require a flat roof replacement in Phoenix eventually. 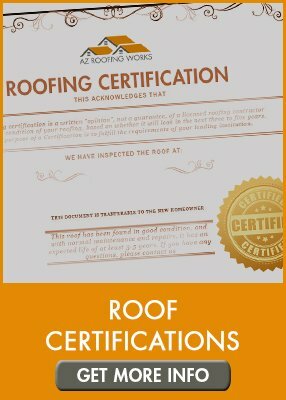 If you are in need of any roof repair service in Mesa, Phoenix, Scottsdale or any other Metro Phoenix location, AZ Roofing Works is ready to help you! Contact us today, either online or call our office directly at (602) 283-3383.